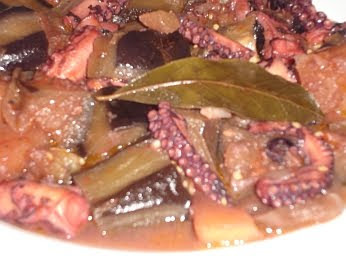 Octopus is a popular seafood dish in Greece, though it is an acquired taste. 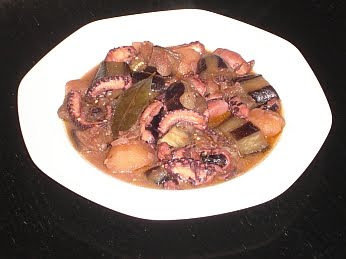 I previously posted the recipe for Octopus With Pasta and this is another popular recipe, where the octopus is prepared with eggplants and potatoes. Remove the stems from the eggplants and peel in stripes – peel one length of skin, leave one length, peel another length etc. Put in a bowl of water with 1 tablespoon salt. Cover with a plate to keep the cubes under water. Clean the ink from the octopus and remove the eye. Cut the tentacles into 5cm lengths. In a heavy bottom pan heat the oil and then add the octopus. Fry until all the liquid from the octopus has gone, but the oil remains. Add the onion and fry for 3 minutes. Ad the garlic and fry for another 2 minutes. Add the red wine and continue cooking for 5 minutes. Add the tomato puree and bay leaves and simmer for 1 hour. After 1 hour, add 400 ml water, drain the eggplants well and add them along with the potatoes, salt and pepper to the mixture. Cook for approx. 30 minutes until the potatoes are tender. That octopus dish looks awesome! Will try that one day most certainly. I guess you could use the baby octopus as well- I prefer the small ones to the big fat tentacles! Sorry I have to disagree. I think that looks disgusting. However how it looks and how it tastes may be two completely different things. By the looks of it though I'm not sure I could put it in my mouth. Then you are missing out Jordasche. Octopus is fantastic and to put it together with aubergine and potatoes and red wine/ garlic/ onion sauce would make it taste even more fantastic. If I had worried about how food looks I would never have tried all the fantastic sea food I have over the years. I even tried an oyster once and those just look like snot, but I still tried. For the record- oysters are grim but octopus is really worth trying, the baby ones are nicer.